Im wrting a dapp which holds / manages sensitive data which might need to be encrypted and decrypted and push again into chain. I know it is not safe to encrypt data in smart contract,which is why Im thinking of off-chain encryption mechanism . I thought to encrypt data using public key and then decrypt using private key . However I found that popular wallet s/w like metamask doesnt allow this. 2.If using custom keys for encryption, Is it ok using a keymanagement tool like Google KMS or Amazon Kms to manage keys and encrypt data? MetaMask does not support encryption/decryption but is support off-chain signing that you can verify on-chain. 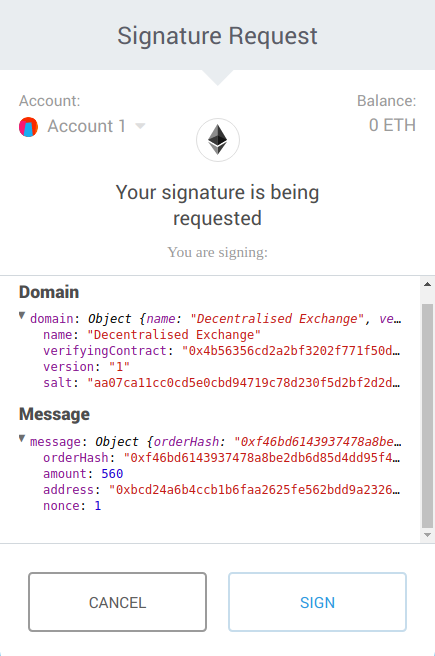 The signature will use the user private key. This way it is 100% authentic. For the data, you can save off-chain or on-chain. But instead of encryption and decryption, you have to use ask the user to sign and you can later verify the signature on and off-chain. Not the answer you're looking for? Browse other questions tagged metamask encryption or ask your own question.